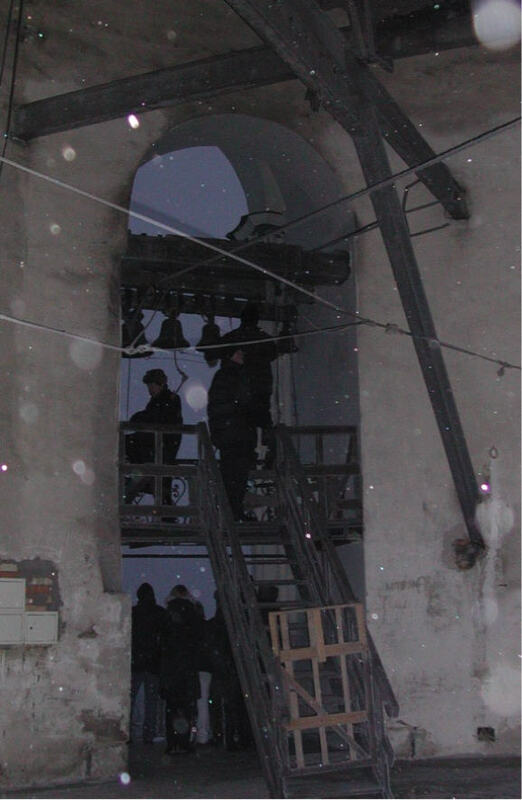 Breathless and late, we arrived in the midst of a snow storm at the top of the bell tower in the Kyiv Persch Lauvra, an ancient Orthodox monastery. It was 16.35 and a single, deep bell had been sounding as we climbed the many stone steps. As we stepped onto the platform near the top of the tower, a voice from a small platform above us called us to pray for Ukraine. I peered into the semi-darkness, but all I could see were the silhouettes of two dark forms hunched over pedals and ropes. Then, beginning with one bell and rhythmically introducing the others, the men brought forth incredible sounds which caused the entire tower to resonate with their power. At various intervals, the bells would stop, and those listening would be asked to pray for their health, or for the unity of the church, etc. At the end, the bell ringer descended from his platform and although most people left, a remaining ten or so gathered around him. He took out some incense and a small brush, and anointed people with the oil/myrrh mixture. He brushed the oil not only on people’s foreheads, but also on their nose, their cheeks, in the ears, on their necks. He said that when his leg feels stiff, and he feels like he will not be able to push the pedal to play the bell, he just anoints himself with this oil, and within an hour he feels better. He also had messages for individuals. One man whose eyelids he painted with oil he told, ‘God will heal your eyes. But you must stop looking at bad things first.’ He had a message/prophecy for each person.